Having worked in a Regional Schools Commissioner’s office, LKMco Associate Kate Bowen-Viner knows a thing or two about the Free Schools Programme. Indeed, having published “The 6 Predictable Failures of Free Schools… and how to avoid them” by Laura McInerney back in 2011, it’s an area we’ve had a long running interest in as a team. 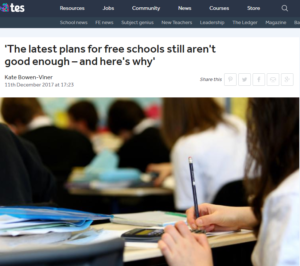 “There are better ways of reforming the free schools programme. An increased focus on school place shortages would ensure that the system works for local government, school providers and most importantly pupils. The free school programme is simply a vehicle for creating new schools. Free schools can come in different shapes and sizes, with different practices. They vary in quality, like any other school type. It is odd to expect the mere existence of a free school to improve the quality of education on offer and result in enhanced social mobility. Of course, some free schools have had great success, but that is probably not just because they are free schools.